Not many managers get the best of Pep Guardiola, but Jurgen Klopp has had his opposite's number, and after Liverpool repeatedly frustrated Man City last season, it's on the former to rethink his approach in a match that could go a ways in determining the title. Some matches loom larger than others. Sunday’s meeting of Liverpool and Manchester City at Anfield will not decide the Premier League title, but it could determine the nature of the campaign to come. On one side there is Man City, the favorite to retain the title. On the other, Liverpool, which beat City three times last season and which looks like the squad best equipped to challenge this season. If City wins, this season is likely to be another procession. If Liverpool does, then there might actually be a title race. But it’s a game that has ramifications beyond the immediate context of this Premier League season. There is the relationship between the two managers. Only seven managers have a positive record against Pep Guardiola; Jurgen Klopp is the only one of them to have faced Guardiola more than three times (the other six are Roberto Di Matteo, Ronald Koeman, Carlo Ancelotti, Claudio Ranieri, Bruno Genesio and Paul Cook). A record of eight wins, five defeats and a draw in their 14 meetings shows just how disruptive Klopp’s football can be to Guardiola’s. That raises questions about tactical evolution. Why should the hard-pressing German school of which Klopp was a pioneer be such a problem for Guardiola’s juego de posicion, and what does that mean for the future of the game at elite level? But there are also more immediate psychological issues. Guardiola is not used to having problems he cannot solve, and there were suggestions in the two Champions League games last season that against Klopp he has a tendency to overthink. The two league games had both been extraordinary in their own way. When they met in September, in the fourth game of the season, Guardiola had fielded a back three against Klopp’s usual 4-3-3. City had taken the lead, but the game was relatively even when Sadio Mane was sent off eight minutes before halftime for a high foot on Ederson. City went on to win 5-0. By the time they met in January, though, Liverpool had brought in Virgil van Dijk and generally looked like a better balanced side than it had, while City had switched to a 4-3-3. 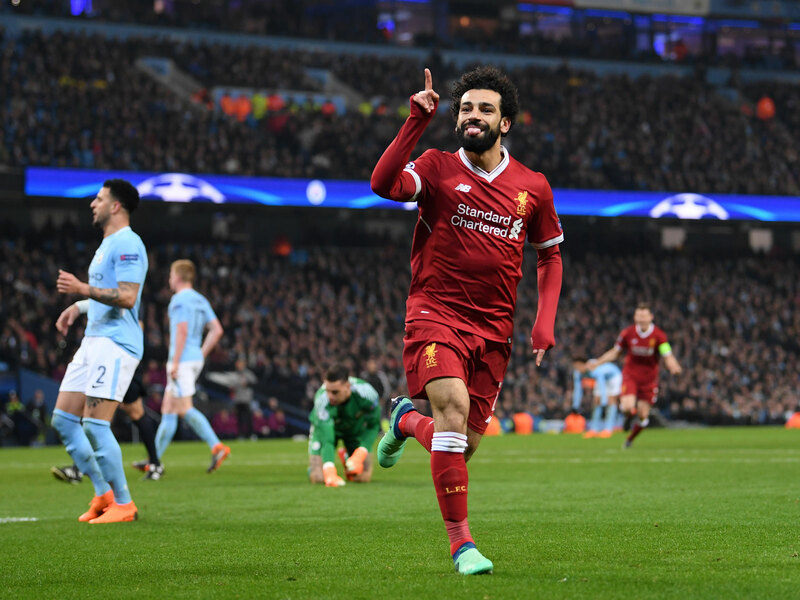 Three goals in an astonishing nine-minute spell just after halftime gave Liverpool a 4-1 lead, and although City pulled two back late on, the odd habit of Guardiola sides of suddenly conceding goals in a flurry had been exposed again. For the first leg of the Champions League quarterfinal at Anfield in April, Guardiola made a major change. Raheem Sterling was left out, and in came Ilkay Gundogan, operating in a strange tucked-in role on the right. The reason was presumably that he could help protect Kyle Walker at fullback while simultaneously adding a body to the midfield, helping City control possession and thus the game and so preventing the sort of surge that had brought Liverpool the flurry of goals in the January. It didn’t work. Andy Robertson was given space and used it to dominate the Liverpool left/City right, while City, as it often did when fielding all four of Gundogan, Fernandinho, David Silva and Kevin De Bruyne, seemed a little mannered in possession. One of Guardiola’s great gifts is his willingness to adapt and his capacity to counter problems; here was a rare example of his solution causing more problems than it solved. For the second leg, having to chase the game, Guardiola went for a very attacking 3-1-4-2. The immediate context, allied to second-half collapse after he had been sent to the stands at halftime, makes the game difficult to analyze, but City did cause Liverpool problems in the first half, and but for an incorrect offside call would have gone in 2-0 up at the break. The suggestion, though, is that Guardiola is concerned by Liverpool’s ability to evade City’s press and expose the back line, and would ideally prefer to field an additional central defender with Fernandinho sweeping front to provide cover. Unless he takes the extraordinarily cavalier step of playing Leroy Sane as a left wingback, whether he can do so is probably dependent on whether Benjamin Mendy has recovered from a bruised metatarsal. Guardiola confirmed Friday that Mendy is in contention to be selected, but given he has not played for a month, having him return under these circumstances is a major gamble. If Mendy is deemed unfit, the likelihood is that Guardiola will use his familiar 4-3-3, but the evidence of last season is that it places tremendous pressure on the two fullbacks, Walker and, presumably, Aymeric Laporte. Klopp’s style of football never deposed Guardiola’s exactly; rather Gegenpressing ended the hegemony of juego de posicion so that it became just one style among many at the top of the game. Sunday’s meeting is the latest chapter both in that ongoing negotiation and in the rivalry between Kopp and Guardiola. It is also vital to this season’s Premier League title race.